Much copied but never bettered, the Vixen GP2 mount is the benchmark for those wanting a solid, dependable equatorial observation or imaging platform. The GP2 mount system features accurate tracking and is an excellent platform for serious astronomical observation. A wide selection of optional accessories are available allowing you to customise the GP2 mount’s features to fit your observing needs. Accepts payloads up to 7kg. The D3M motor controller set can be added to the mount. The 2˚ incremental altitude scale and optional polar axis scope set assist with accurate polar alignment. 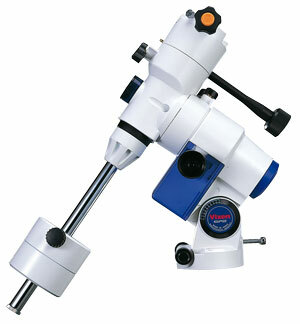 The dovetail plate attachment system allows you to attach an optical tube easily and quickly. Please note that the current versions of the GP series mounts have a 45mm footing. Previously, the footing was 60mm diameter. Click here to find out more information about these changes. Please note that the later versions of the GP series mounts had a 45mm footing. Previously, the footing was 60mm diameter. Click here to find out more information about these changes.